Hunan Province lies in the south of the middle Yangtze River valley, with its name meaning "south of the lake" because most of the province is located on the south of the Dongting Lake. Situated 108'47"-114'13" east longitude and 24'38"-30'08" north latitude, it has an area of 210,000 square kilometers. With mountains in the east, south and west, the land generally slopes from the south towards the north in the shape of a horsehoof-like basin. 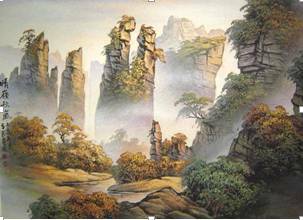 Topographically, it may be divided into five parts. 1) The Dongting Lake Plain in the northeast, contiguous to the Jianghan Plain of Hubei and with numerous rivers and lakes, is known as a "land of fish and rice". 2) The Central Hunan Hilly and Basin Area has wide areas of low hills and mounds and basins and valleys, Hengyang is the largest of the basins. The scenic Hengshan Mountain, whose main peak is 1,290 meters above sea level, is one of China's five sacred mountains. 3) The Nanling Mountain Area, rising mostly more than 1,000 meters on the southern border, is the watershed of the Yangtze and Zhujiang river systems and the climatic divide between central and southern China. 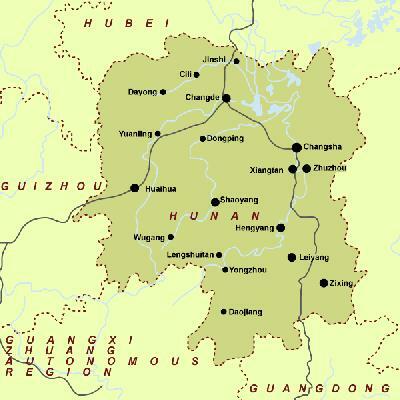 4) The Eastern Hunan Mountain Area is the watershed of the Xiangjiang and Ganjiang basins. 5) The Western Hunan Mountain Area, mostly exceeding 1,000 meters in elevation, comprises mainly the Wuling and Xuefeng mountains: Extending for more than 300 kilometers, the Xuefeng range is the natural and economic divide between the western and eastern parts of the province. Hunan in the sub-tropical area has a warm climate, with cold, short winters and hot, long summers. It has four clearly contrasted seasons, abundant rainfall, and a mean annual precipitation of 1,300-1,700 mm. Its mean annual temperature is 16oC-18.5oC -- the hottest month, July, averaging 26-30oC and the coldest month, January, 4-7oC. It is divided into 1 autonomous prefecture, 13 prefecture-level cities, 16 county-level cities, 65 counties and 7 autonomous counties, with a population of 64.40 million by 2000, mainly including ethnic groups of Han, Tu, Miao, Hui, Dong, Yao, Hui, Uygur, and Zhuang, etc. Xiang Cuisine (Hunan Cuisine) is one of the Eight Great Cuisines in China. Famous dishes include Dong'an Chicken, Peppery and Hot Chicken (Hot and Spicy Chicken), Orange Beef, Sweet and Sour Chicken, and Crispy Duck, etc. Xiang Opera, Huagu (Flower Drum), Shadow Plays, and Flower Lamp, etc. The traditional local specialties include Changsha Xiang Embroidery, Liuyang Fireworks and Firecrackers, Yueyang Fan, Changsha Xiang Lotus, and Yueyang Whitebait (salangid), etc. Hunan Province, known as Xiang for short, is located at the south bank of the middle reaches of the Yangtze River, with Changsha as its provincial capital. According to archaeological finds and recorded history, there were human beings living in this area more than 8,000 years ago. Hunan Province was officially set up in 1664 during the Qing Dynasty (1644-1911). Hunan is known as the land of fish and rice because of plentiful production of rice, cotton, tung oil, orange, and fresh water fishes. It is also noted as the home for rich mineral resources. Hunan Province is famous for its picturesque scenery. There are places of historic interest and scenic beauty, such as Yuelu Mountain, Hengshan Mountain, Jiuyi Mountain, the Yueyang Tower, the Dongting Lake and Wulingyuan Scenic and Historic Interest Area. There are a lot of celebrities in Hunan history, and the most famous are: Qu Yuan, a great poet and one of the four ancient cultural celebrities in the world; Cai Lun, who invented papermaking and made the first piece of fabric paper in the world; Qi Baishi, the most famous contemporary Chinese painter; Mao Zedong, the founder of the People's Republic of China; Yuan Longping, who is well known in the world for the rice-hybriding skill. The former residences of these celebrities and sites of some revolutionary events, as well as the distinctive ethical folk arts of Miao and Tu ethnic minorities in Hunan, are quite worth a visit. There are more than 4,700 waterways in Hunan, the largest being the Xiangjiang, Zishui, Yuanjiang and Lishui rivers, all of which flow into Dongting Lake, forming an integrated water system. Dongting, the second largest freshwater lake in China, takes the floodwaters of the Yangtze River in addition to the waters of the four large rivers, and flows into the Yangtze River at Chenglingji.